Believe it or not – it is roughly four weeks to Christmas (for those celebrating) and we have to admit we like the festive season! A mug of mulled wine, spicy ginger bread, and friends and family gathering. And if you have plant loving people among your family and friends, it is such a pleasure to hunt for green gifts. Just to be clear: Don’t forget to spoil yourself too, plant friend! After all we all deserve a little green treat every now and then. 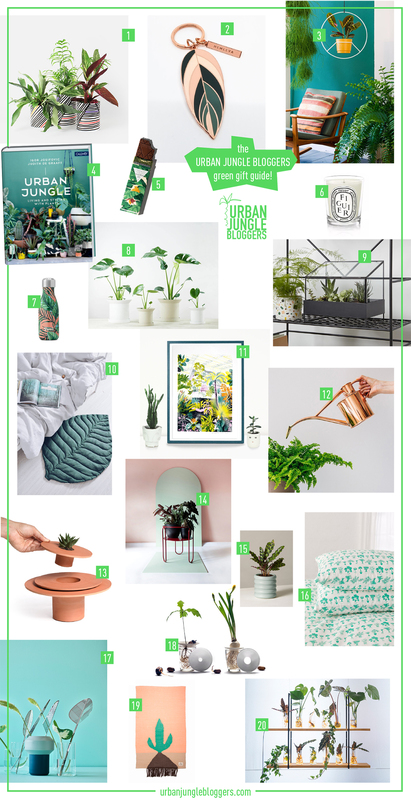 Like last year we compiled a Green Gift Guide for you that is totally Urban Jungle Bloggers approved! Cool new plant pots, a stylish watering can, botanical bedlinen or even ‘planty’ chocolate – we have a few ideas if you are on the hunt for some green presents. Of course we just had to include the Urban Jungle Book in the gift guide too – after all we believe it is a fantastic addition to any plant loving home. And it’s available in ten languages now (English, German, French, Dutch, Czech, Swedish, Norwegian, Russian, Korean and Chinese), There is no excuse to not start your green gift hunt! Here is a fantastic list of 20 green gifts for plant lovers at your service! Happy gift shopping!